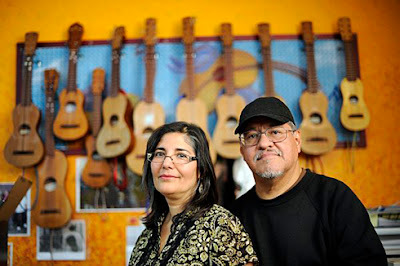 There is no way to write about Tia Chucha Centro Cultural, LA’s official Poet Laureate Luís Rodríguez or his wife Trini Rodríguez objectively or impartially. My life as a writer, a publisher, a journalist and a cultural worker has been, for decades, too closely tied to Rodriguez and his perennial work as a mentor, poet, novelist and humanitarian. The efforts he has undertaken as a gentle yet still indefatigable cultural engine on his own and his fortitude alongside an equally strong life partner at the helm of the famed San Fernando Valley bookstore, coffee house and cultural hub are too much a part of who I have become and who I still aspire to be for me to pretend neutrality. Central to this confession or--as they say--in the interest of full disclosure, I have to point to the fact that Luís and I share a history that began more than ten years before we actually met in person. It was during that meeting, which took place during the early 1990s at the San Antonio Inter-American Book Fair, that I had the opportunity to hear him read from his then newly minted poetry collection, Poems Across the Pavement. A signed copy of the slim paperback collection under my arm, I marveled at the soft-spoken poet with a prominent chin, a Midwestern accent acquired after years in Chicago away from his native East LA and his humble, unassuming demeanor. Among the many other prominent writers there—Sandra Cisneros, Ana Castillo, Dagoberto Gilb and a slew of leviathan authors from Latina America like Ernesto Cardenal and Isabel Allende—Luís was easily the most approachable. Next to OG veteran, ex-pinto poet and political organizer Raul Salinas (Un Trip Through the Mind Jail, Editorial Pocho-Che), who I’d been tagging along with for years, Luís was deferential and reminded me how fortunate I was to have been taken under the wing of such a revered literary and activist community elder. I would learn many years later when work brought me to Los Angeles at the beginning of the new millennium, that more than a decade before I’d found my way to that book fair table in Central Texas, Rodriguez had participated in a summer journalism program at Berkeley for writers of color and had shared a dorm on campus with poet Peter J. Harris and my oldest sister Joanne Salas, both of whom were also chosen to participate. My sister had attended Basset High in La Puente from 1971-1972 during a brief family sojourn to test the waters in Southern California. She had become politically active as a result of her exposure to the region’s nascent Chicano Movement and its loud clamor for education, equal rights and an end to discrimination as well as law enforcement abuses in the Mexican American communities on LA’s East Side. Once back in our native Texas, she’d flung herself immediately into local struggles, joining a chapter of the Brown Berets, leading protests and putting together a small barrio newspaper called La Conciencia in the predominantly Mexican American East Side of Austin. In the summer of 1979, just before I was to begin high school, I helped her drive to the Bay Area from East LA, where she had moved to soon after completing her studies at the University of Texas. I was all of 14, and during a “family vacation,” which was really just a cross country trek to check in on her and another sister who had followed her out west, my father asked me if I'd be willing to accompany her on the drive north in her first independently purchased car, a bare bones Datsun B-210. I would board a Greyhound once we got my sister to Berkeley for a three-day bus ride back home. I had no idea she would be spending the summer learning the journalist’s craft alongside the now stalwart writer and community leader who would herald my own arrival in Los Angeles a lifetime later—and still a whole decade after first meeting him personally—as the subject of an interview I published in the Los Angeles Times Magazine. Titled “A Writer with a Rich Sense of Place,” the piece was hinged on the successful release of his short fiction collection, The Republic of East L.A. Reconnecting with Luís and meeting Peter Harris was proof that I was where I belonged. It was Peter, whose powerful new book of poetry, Bless the Ashes, is a Tia Chucha Press project, who first realized that he, Luis and my sister had all trained as apprentice reporters together that summer in the East Bay. Since then, Luís has accepted invitations to share his words in Brooklyn & Boyle, going as far back as our inaugural issue in 2008. He has ventured often across the vast distance from the San Fernando Valley to read poetry on 1st Street in the Boyle Heights space that we called Brooklyn & Boyle until it was unanimously christened Corazon del Pueblo, an autonomous space so many of us loved with all our hearts and tried to model after Tía Chucha’s. When my mother was nearing the very end of her battle with cancer in 2008, I found myself shadowing Gloria Alvarez, a poet madrina and honorary soul sister. She was on her way to Sylmar, to an earlier incarnation of Tía Chucha’s to visit with Luís and talk about books and poetry and dreams and memories. Again, Trini and Luís offered a warm welcome and shared a profoundly beautiful strength. The money to fly east and bury my mom appeared almost as if by magic only moments after Gloria and I said goodbye to Trini and Luís. When Luís made a run for Governor of California as a Green Party candidate to call attention to the skewed institutional and free market priorities that put profits before people and our precious, delicate ecosystems, I was in. A poet with a glittering voice and a soul that radiates with infinite empathy and compassion as Governor? A loud, unequivocal “si se puede” to that. Accordingly, I conceived a poetry tour by train, an alternative to the old-time train stop stump speeches, which would feature poets and gather signatures to help get Luis on the ballot in the primary. Enlisting a brilliant young El Sereno poet and activist named Iris de Anda as my co-conspirator, we marshaled the troops and read guerrilla style at four Eastside Gold Line Metro stops, ending at Union Station. It was even beyond magical at that point. It became an undeniable agency for change, for a shift at the core of our existence in favor of life and health and peace and, above all, love, a harmonious call for a kinder society along the Poetry Locomotive in support of his candidacy. Today, Luís Javier Rodriguez is a blur, a non-stop, poetry-in-motion, human rights advocate, gang-intervention specialist and great-grandfather of two. Appointed by L.A. Mayor Eric Garcetti in October to serve as Poet Laureate, Rodríguez remains thrilled and excited by his new role as the ambassador for the LA’s literary arts community. Author of over a dozen books, he has spent years making amends to his family, healing rifts and dedicating himself to bringing his children, their children and, now, their children’s children together for renewal and rebirth. “My appointment is for two years,” he says over the phone from the Hudson River Valley in New York, where he and Trini have been invited to conduct workshops in community organizing for students from around the world. “I was appointed in October, but I was able to work with the Mayor’s staff and get them to agree to begin in January.” While the post comes with a great deal of responsibility, he seems perfectly suited for the role. He is, however, just as excited about the two great-grandchildren who have entered his life recently. “I have five grand kids and two great grand kids,” he says with satisfaction. It is easy to imagine the beaming smile from across the country on the other end of the cell phone connection. As Poet Laureate, he was invited to be a primary proponent and representative for “The Big Read,” a city-wide literacy project that brought Luís Alberto Urrea’s new book Into the Beautiful North to schools, book clubs and libraries across the greater LA area. “The next book, in 2016, is going to be by Ray Bradbury,” he says. He is able to travel and tour so frequently as a highly sought-after presenter and speaker, he explains, because he has a stable and capable partner at his side. In addition to maintaining their home and overseeing the care and feeding of an extended family, Trini also oversees operations at the cultural center, a genuine community space which has been the truest reflection of their long and meaningful partnership. As the Interim Executive Director at Tia Chucha Centro Cultural, she relies on volunteers. She continues to be amazed at the response from the local communities in Sylmar and the greater San Fernando Valley. “How driven we are by the vision is really important. We've always had a really strong vision,” she’s says after Luís has handed her the phone in an effort to help me understand how they are more than a couple. It is because of the committed partnership and patience with others that they have been able to overcome all the obstacles and challenges that have sprung up along the way. A recent fundraiser for Tía Chucha organized by writer, musician and eastside cultural icon Rubén Guevara at the Pico House adjacent to downtown's Placita Olvera drew hundreds for an exhibition, art auction, poetry reading and concert. Headlined by Grammy-Award-winning band Quetzal, the event was clear evidence of how widely the Tia Chucha legacy is regarded. “Recently it’s been really apparent. Part of seeing that it’s viable is allowing other people to step in. At some point we’ll want to let it go,” she continues. Because they are in New York at the Watershed Center together, she is reminded of those milestones that indicate Tia Chucha’s is in good hands even during their absence. “It’s seldom that Louie and I are gone. But it’s about relationships. It’s not just a business venture. We want to make sure we’re responding to the community,” she concludes. Tia Chucha Press, says the Poet Laureate, is gearing up for its first major anthology of LA area poets. The book, Coiled Serpent: Poets Arising from the Cultural Quakes and Shifts of Los Angeles, will be ready next spring. “At first I was a little worried because we had more than 150 submissions. But I have three other editors working,” he offers. The title stems from the universality of the serpent symbol in global cultures. “In Africa and Asia as well as Mexico and the rest of Latin America, it’s a recurring image,” he explains. In the cultures native to those places, he adds, the serpent represents beauty and wisdom.